LinkedIn irked privacy advocates by dropping a Bluetooth-enabled "Tinder for marketers" feature into its mobile app on Thursday. 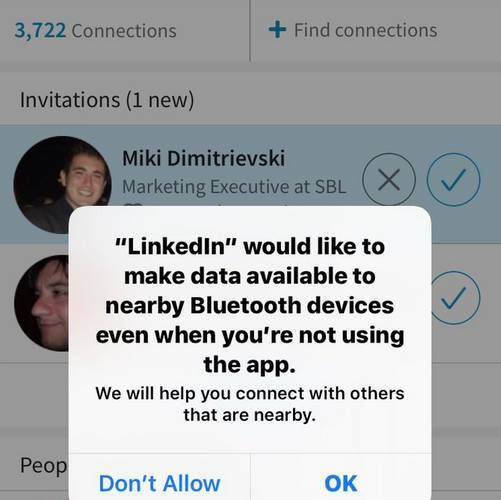 Respected security researcher Rik Ferguson was nonplussed at changes in LinkedIn's mobile app that threw up a pop-up requesting permission to share data with nearby Bluetooth devices even when users weren't using the business networking app. The pop-up sprung after an update that billed itself as only offering "general bug fixes and performance improvements". Ferguson shared a screenshot of the discombobulating prompt on Twitter. The reaction was negative and snarky with more than a few suggesting the way to go was to delete the app. In a statement to El Reg, LinkedIn said it was trialling the technology as a way of making it easier for users to connect with each other at conferences and similar events. It admitted the delivery of the prompt to enable this feature was a bit off and promised a prompt revision. In order to help our members more easily connect with one another, we're exploring an opt-in "find nearby" feature that will help them find other members nearby. This will be an opt-in experience and members will have control of when their location is used for this feature. A prompt to enable Bluetooth on our iOS mobile app went out in error to a small group of LinkedIn members. We are working on a fix immediately and we apologise for any confusion. In response, Ferguson questioned whether the incident was isolated to a small group of users. "Plenty of people on Twitter were able to replicate and I replicated it on three phones all running 9.1.25 of the app," he said, adding "as if by magic, it looks like 9.1.26 came out this morning." In related news, Microsoft-owned LinkedIn this week notified users about upcoming revisions in its terms of service, due to come into effect in early June.